When I first started studying Japanese years ago, I became immersed in learning the written language, from hiragana and katakana (the phonetic language systems) to the actual characters—the kanji. 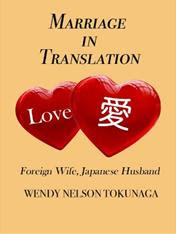 And Celeste Duncan, the protagonist in my forthcoming novel, Love in Translation, also discovers an inexplicable connection to kanji once she finds herself in Tokyo. No one, though, is as obsessed with kanji as Eve Kushner, a Berkeley-based freelance writer and blogger, who is a certifiable kanji addict. But instead of just sitting in her attic deconstructing kanji all day, she has channeled her obsession into an entertaining and delightful book called Crazy for Kanji: A Student’s Guide to the Wonderful World of Japanese Characters, published by Stone Bridge Press. 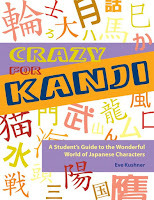 Crazy for Kanji is filled with interesting facts, photos of kanji in action, cultural clues, games, puzzles and more. Whether you are a serious student of Japanese or simply fascinated with these characters for both their beauty and practicality, you will find Crazy for Kanji a fun and engrossing read. Eve stopped by to answer a few questions. How did you become interested in kanji? Why Japanese? Why not Chinese characters, from which kanji developed? I was forced to study several languages as a child, and I hated it (because I hate anything that I'm forced to do), but as an adult I've discovered that I love learning languages. In fact, the whole reason I started studying languages as an adult is that I went to hear the writer Rita Mae Brown speak at Black Oak Books in Berkeley. When a woman asked for advice on becoming a writer, Brown advised her to learn as many languages as possible, explaining that when you see connections between Latin, French, Spanish, Italian, English, and so forth, lights and bells will go off for you, and it will enrich your understanding of English immeasurably. After I heard that, I decided to study a different language every semester until I'd learned a little bit about 20 or 30 of them! I studied Spanish for four years after that, and found that Rita Mae Brown was right. After Spanish, I tackled Japanese, because I'd felt fascinated with Japan since age 13, when I traveled to Japan and China with my family. We spent very little time in Japan and much more of the time in China. The contrast between the two was striking, because at that time (1981), Japan was quite advanced technologically (much more so than the United States), whereas China was definitely not. I fell in love with Old Japan—with the small bridges and gardens and all the daintiness of shoji screens and temples. Then in college I took a course where we covered the "greatest hits" of Japanese and Chinese literature in 10 weeks, and it was the Japanese literature (Kawabata, Tanizaki, Mishima) that moved me in particular. And then you moved on to formally studying Japanese? Yes. In the late '90s, I discovered the now-defunct literary magazine Japanophile. I was trying to find my niche as a freelance writer, and they did eventually publish several of my articles. As I began to develop the idea of myself as a writer who covered Japanese topics, it became apparent that I should learn to speak the language. When I started to tackle Japanese in 2001, I was hardly a natural at it, but I kept going. In our third course, we started kanji, and I hated every single bit of the way we learned it. I had no idea why we needed to write words with these complicated characters. Up till then, we'd written words phonetically, and I didn't understand why that was no longer enough. Again, because I felt forced to learn kanji without knowing why, I initially resented it. It didn't help that the teacher seemed to feel no affection for kanji at all. In Japan and elsewhere, kanji are so often treated as bitter medicine to "swallow" (via rote, joyless copying and memorization), and that was the feeling she passed on to us. And this turned into an obsession, which turned into love, and before I knew it, I came to love the very thing I used to hate! How did Crazy for Kanji come to be published? I met Peter Goodman, the publisher of Stone Bridge Press, in the late '90s when he was selling books at the Solano Stroll street festival in Berkeley. I fell in love with several of his books and with the whole idea of what he was doing. Soon after I met him, I profiled him for the East Bay Express and Japanophile. I also reviewed some of his books for various publications and we continued to keep in touch. Friends who knew of my kanji obsession were always telling me I should write a book about kanji and I began to seriously think about it. I approached Peter and he told me to write up a proposal. Much to my delight, it intrigued him, and he instructed me to go in particular directions, such as explaining the basics of how kanji work and even writing about the use of characters in China, Korea, and Taiwan. After a lot of hard work, Crazy for Kanji came to fruition. Do you have a favorite kanji? I'm really crazy about 意—pronounced “i” (as ee, in English). For one thing, I think it's adorable. It reminds me of an upright animal, complete with a curving tail. I blogged about this at http://blogs.japanesepod101.com/?p=940, so the explanation and images there should give you a better idea of what I mean. Also, since 意 means "heart, mind, thought, meaning, sense," it factors into words about consciousness, intentions, thoughts, and feelings, all of which fascinate me. What's up next for you on the kanji horizon? I'll definitely keep blogging about kanji, and that occupies a huge amount of my life. I'm less clear about my kanji explorations in the long term. As long as I keep blogging, I'll eventually cover many of the Joyo kanji (the approximately 2000 characters used in daily life in Japan). Without killing the spontaneity and fun I now feel whenever I investigate kanji, it might make sense to be more goal-oriented about covering the Joyo, so eventually I will have written essays about all of them, creating a kind of Joyo encyclopedia with essays on each character and its etymology and compounds. And, last but not least, what is your favorite Japanese food? I'm a tea addict, so I love green tea ice cream. When it's done right, it's tantalizingly full of possibilities. It seems to hint at something, but ... what? That "something" is always just around the corner, luring me on. Be sure to visit Eve at her Web site and at her Kanji Curiosity blog. Eve is participating in a number of events in the San Francisco Bay Area throughout 2009, including appearances at the Asian Art Museum and the Soko Gakuen Language School in San Francisco. Get more details here.